Drive down the fuel bill | What Car? You can slash your fuel bills by choosing the cheapest route and by making your car and driving style more efficient. Heres how. a shorter, more direct journey can shave pounds off your fuel bill, and take only a few more minutes. Keeping your tyres pumped up could save up to 25% on fuel. Its all down to resistance under-inflated tyres create more flex, so it takes more energy to move them than it would a correctly inflated tyre. The lighter your car is, the less energy itll use, so dont lug around empty child seats or a boot full of tools. If youve got a spare wheel, consider ditching it for a can of puncture repair foam to save weight. Switch off your air-con and other electrics if you dont need them on. Driving around with your air-conditioning on full blast can hit your cars fuel economy by up to 20%. Obviously, if its 30 degrees outside youll want it on, but otherwise keep it off or on low. Climate control is more efficient than manual air-con, so bear that in mind when buying your next car. Other electrics (headlights, stereos, sat-nav systems etc.) all drain energy from your car, which means it also lowers its mpg. Wind-up the windows, and remove roof racks and boxes when not being used. Even giving your car a good polish will reduce drag. Many drivers believe that cars achieve optimum efficiency somewhere between 50mph and 60mph. Not true as long as youre in top gear, the slower you go the more miles per gallon youll do. Obviously, going along at 30mph on the motorway isnt practical or safe, but cruise at 60mph rather than at 90mph and youll do roughly twice as many miles to the gallon. On slower roads, if you drop your speed from 60mph to 40mph youll save around 25% on fuel. In top gear youre pumping less fuel from the tank, which means in sixth gear at 40mph youll save around 20% in fuel compared with fourth. Theres obviously a limit to how early you can change up if your car is shuddering violently and has next to no acceleration, youre in the wrong gear but you might be surprised how early you can go up a gear. Some newer cars come with built-in shift indicators, which tell you which gear to select. Your car is at its least efficient when getting off the mark and speeding up, so pull away slowly, accelerate smoothly and avoid using the brakes unnecessarily. The stop-start nature of city driving will make this tricky, but try to anticipate the road ahead and stay in gear when youre slowing down. a queue for more than a minute. Some modern cars, such as those BMWs fitted with the Efficient Dynamics systems, will do that when you select neutral. Remember, when youre not moving and your engines running, youre doing zero miles to the gallon. At the end of your trip, make sure you park up so you can set off in a forward gear. Reverse moves use more fuel, and are even thirstier when the engine is cold and less efficient. 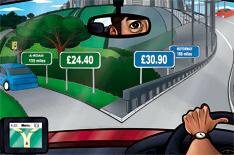 Choosing the most direct and economical route for your journeys can make big savings in fuel, and if you make your car and your driving as efficient as possible, too, youll be quids in.